Aubineau Building: The earliest buildings on this site were wood frame saloons, which burned in 1886 and 1888 and 1892. 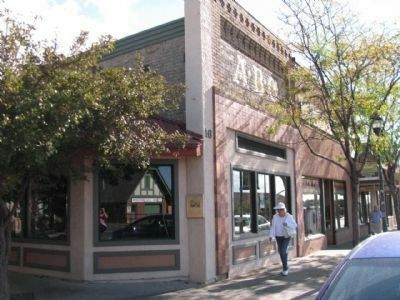 In 1892, ownership passed to Julius Aubineau, who later became Mayor of Flagstaff and is credited with installing the town's first water system, a pipeline from the Peaks. Aubineau built the present brick building in 1893, using it as a liquor store. It was later a saloon, a cafe, and a market. The El Patio Cafe was located here from 1930-1965. A stucco exterior was added in 1935. Jerry Andreatos bought the building in 1944. 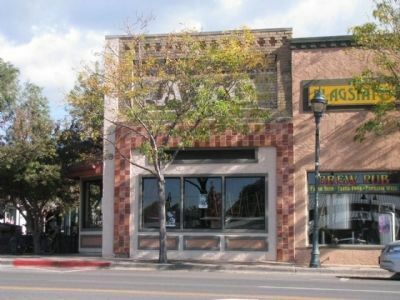 Andreatos Building: In 1952, Andreatos bought this property and built a new frame structure, calling it the El Patio Cafe. 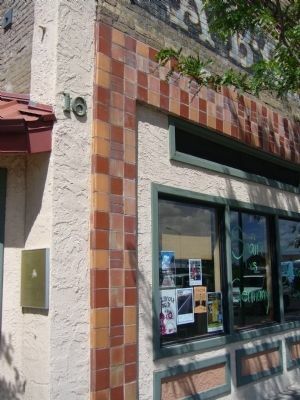 The Aubineau Building then became the El Patio Cocktail Lounge. Wong and Kong: In 1992 both properties were bought by Margaret "Pinkie" Wong, Jo and Bernadette Kong, who had them renovated to reveal the brick inside and out and enhance Aubineau's original vision. Erected by Wong & Kong, Richard and Sherry Mangum and the Main Street Foundation. 35° 11.85′ N, 111° 38.913′ W. Marker is in Flagstaff, Arizona, in Coconino County. Marker is on East Route 66, on the right when traveling west. Touch for map. Marker is at or near this postal address: 16 East Route 66, Flagstaff AZ 86001, United States of America. Touch for directions. Other nearby markers. At least 8 other markers are within walking distance of this marker. Coconino Chop House (a few steps from this marker); Donahue Building (within shouting distance of this marker); Aubineau Building (within shouting distance of this marker); Railroad Depot (within shouting distance of this marker); Transcontinental Railroad Centennial (within shouting distance of this marker); Raymond Building (within shouting distance of this marker); "The Gandy Dancer" (within shouting distance of this marker); McMillan Building (within shouting distance of this marker). Touch for a list and map of all markers in Flagstaff. More. 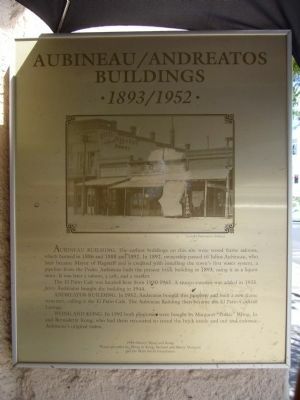 Search the internet for Aubineau / Andreatos Building. Credits. This page was last revised on June 16, 2016. This page originally submitted on July 19, 2010, by Bill Kirchner of Tucson, Arizona. This page has been viewed 1,375 times since then and 9 times this year. Photos: 1, 2. submitted on July 19, 2010, by Bill Kirchner of Tucson, Arizona. 3, 4. submitted on October 7, 2012, by Denise Boose of Tehachapi, California. • Syd Whittle was the editor who published this page.